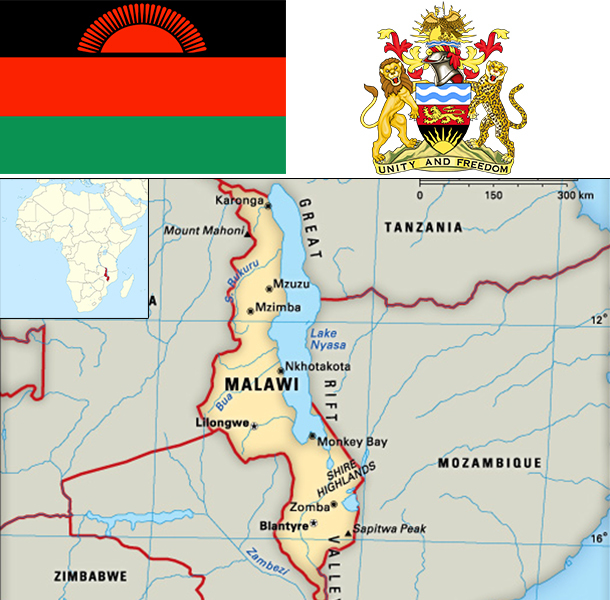 Established in 1891, the British protectorate of Nyasaland became the independent nation of Malawi in 1964. After three decades of one-party rule under President Hastings Kamuzu BANDA, the country held multiparty presidential and parliamentary elections in 1994, under a provisional constitution that came into full effect the following year. President Bingu wa MUTHARIKA, elected in May 2004 after a failed attempt by the previous president to amend the constitution to permit another term, struggled to assert his authority against his predecessor and subsequently started his own party, the Democratic Progressive Party in 2005. MUTHARIKA was reelected to a second term in May 2009. He oversaw some economic improvement in his first term, but was accused of economic mismanagement and poor governance in his second term. He died abruptly in April 2012 and was succeeded by vice president, Joyce BANDA, who had earlier started her own party, the People's Party. MUTHARIKA's brother, Peter MUTHARIKA, defeated BANDA in the May 2014 election. Population growth, increasing pressure on agricultural lands, corruption, and the scourge of HIV/AIDS pose major problems for Malawi. Landlocked Malawi ranks among the world's most densely populated and least developed countries. The country’s economic performance has historically been constrained by policy inconsistency, macroeconomic instability, limited connectivity to the region and the world, and poor health and education outcomes that limit labor productivity. The economy is predominately agricultural with about 80% of the population living in rural areas. Agriculture accounts for about one-third of GDP and 90% of export revenues. The performance of the tobacco sector is key to short-term growth as tobacco accounts for more than half of exports. The economy depends on substantial inflows of economic assistance from the IMF, the World Bank, and individual donor nations. In 2006, Malawi was approved for relief under the Heavily Indebted Poor Countries program. Between 2005 and 2009 Malawi’s government exhibited improved financial discipline under the guidance of Finance Minister Goodall GONDWE and signed a three year IMF Poverty Reduction and Growth Facility worth $56 million. The government announced infrastructure projects that could yield improvements, such as a new oil pipeline for better fuel access, and the potential for a waterway link through Mozambican rivers to the ocean for better transportation options. Since 2009, however, Malawi has experienced some setbacks, including a general shortage of foreign exchange, which has damaged its ability to pay for imports, and fuel shortages that hinder transportation and productivity. In October 2013, the African Development Bank, the IMF, several European countries, and the US indefinitely froze $150 million in direct budgetary support in response to a high level corruption scandal, called “Cashgate,” citing a lack of trust in the government’s financial management system and civil service. Most of the frozen donor funds — which accounted for 40% of the budget — have been channeled through non-governmental organizations in the country. The government has failed to address barriers to investment such as unreliable power, water shortages, poor telecommunications infrastructure, and the high costs of services. Investment had fallen continuously for several years, but rose 4 percentage points in 2014 to 17% of GDP. The government faces many challenges, including developing a market economy, improving educational facilities, addressing environmental problems, dealing with HIV/AIDS, and satisfying foreign donors on anti-corruption efforts.